FischerSIPS had a hand in Super Bowl XLVI, played in Indianapolis, IN this month. 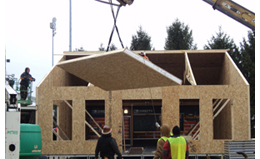 FischerSIPS provided the SIPS for two buildings that became part of the Super Bowl Village in Victory Field. The first building housed Dan Patrick’s Studio. This was a 3 sided ranch-style house that connected to his rolling studio vehicle. FischerSIPS provided the exterior walls (4 ½”) and Roof panels (6 ½”). The roof panels were set over trusses placed on 8’ centers. All panels provided were splined together using 1x3 OSB splines. All panels were pre-fabricated with the lumber installed (commonly called RTA ~ Ready to Assemble) at FischerSIPS shop in Louisville and then shipped to Indianapolis for the village. The 2nd building, a barn structure, used SIPS for the walls only. Once again, all panels were prepared in Louisville prior to shipping to site. With panels up to 8’x24’ in size, a 4 man crew set all of the panels with the help of a sky trak. According to Thomas Moore of Steven Schaefer Associates, the firm who provided the structural engineering for the buildings, SIPS were chosen for the Super Bowl Village to provide a warmer and quieter studio. According to Moore, "Last year, there were problems with sound and temperature control at Dan Patrick's temporary studio. Steven Schaefer Associates suggested the use of Structural Insulated Panels (SIPs) for building his studio this year. SIPs naturally provide a tight building envelope that is resistant to sound and temperature fluctuations. As an added bonus, a SIP structure can be built very quickly, and it comes back down easily as well." It took about 4 days for the crew to put both buildings up. The barn was 1,024 SF and the Dan Patrick Studio was 1,280 SF.